Configuring HTTP Header Proxy Authentication in GeoServer 2.14.2? 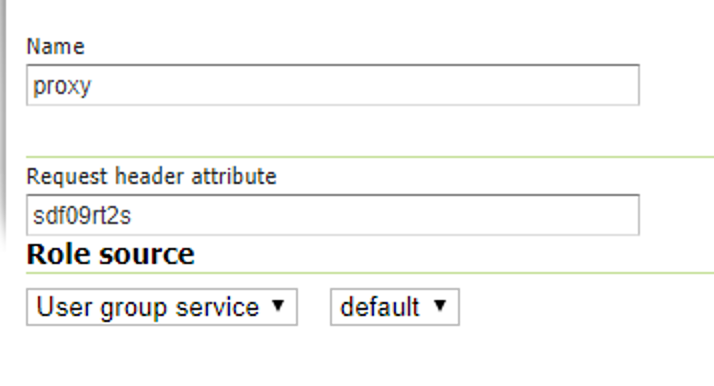 I am trying to configure GeoServer so an API service can make an HTTP request and authenticate by having a header attribute that maps to a specific user role. In following the documentation here I created a "proxy" auth filter and edited the default Filter Chain like this according to the documentation. However, after navigating to other options in the admin interface when the default Filter Chain is viewed again it has reset to this. Why does it reset and not retain the selected auth filters? I interpret the example header attribute is named "sdf09rt2s" and the value for the attribute is the name of the role used for authorization w/in GeoServer, e.g. "admin". However, when testing a 401 error is received. Browse other questions tagged geoserver authentication http-headers or ask your own question. How to use layers from trusted servers in ArcGIS Online?